Needless to say that online radio themes are booming so much nowadays. 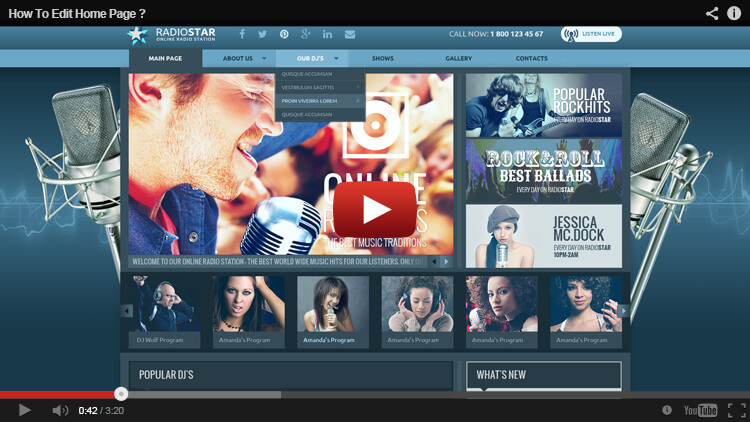 Gridgum is honored to introduce our latest online radio station WordPress bootstrap template which is unique in its multiple colorful pictures that will definitely please your customers. Starting with 7 basic options at the top of the page that tell your customer how the website is organized. Then, comes our beautiful slideshow full of HD pictures that tell your customer about different shows, programs, and music of your website. The slideshow should generally highlight the different services that you offer. After that comes the beautiful card layout display, which indeed allows you to offer up to 14 different services of your online radio station. It is according to the radio website designer the most used tool, so we managed to offer you with as much as possible so you can advertise for every single service, programs or show that you host. In the end, we provide you with an opportunity to introduce with more words your radio to your audience. We are allowing you three short vertical displays that consist of welcoming people to your radio station, stating your mission and announcing your latest news. 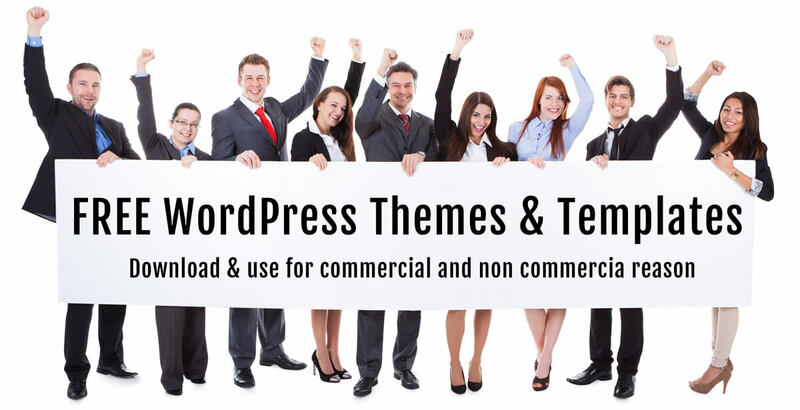 The template has been creating in the WordPress CMS system. WordPress can make your life easier and do all the work for you. It is very easy to manage because it has a website content management system (CMS). Of course, it costs a bit more but if you are part of the serious company who wants to have the well-managed website then this is the product you have been searching for. Another benefit of this WordPress bootstrap Radio theme is that it is responsive which means that it can be opened by any device (PC, mobile phones, iPad) and design will look perfect from every one of it. Of course, the design will change a bit but that’s again altered to be suitable to every device. 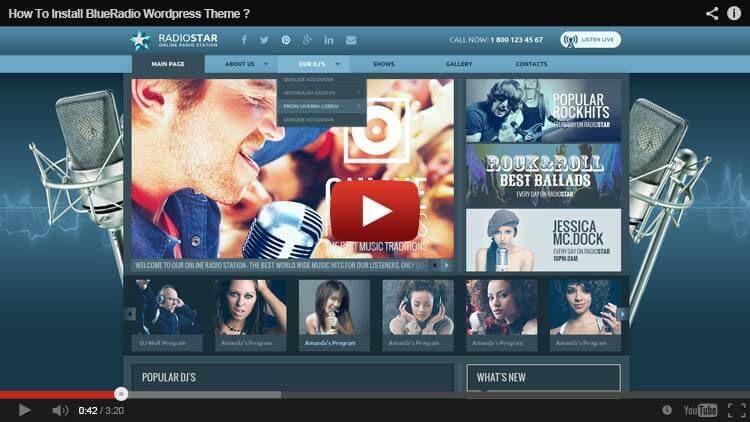 HOW TO INSTALL BlueRadio WORDPRESS THEME ? HOW TO INSTALL Radio Stream Plugin in BlueRadio WORDPRESS THEME ? 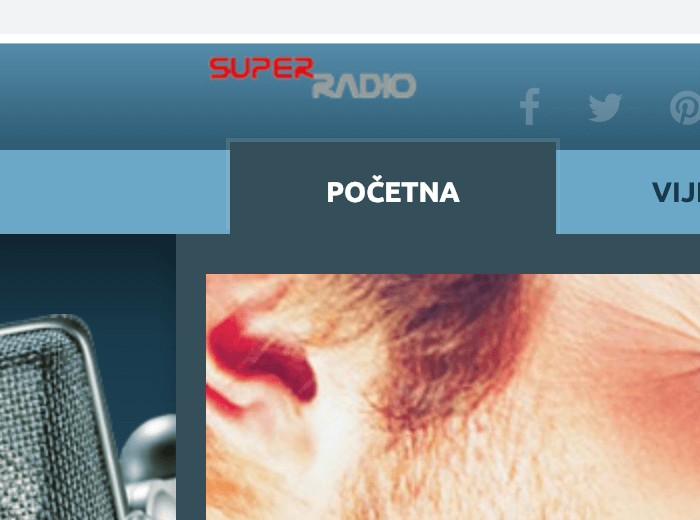 HOW TO EDIT HOME PAGE in BlueRadio WORDPRESS THEME ? Hola, compre e instale el tema ! pero cuál es el usuario y clave de acceso para administrar ? Hello, buy and install the theme! but what is the user and password to manage? would you please be so kind to explain how can we help you ? I couldn't connect to the data base. Dear customer, please install WordPress on your hosting and send us your WordPress admin url address username and password, we do not need your plesk serv er information. i sent to you ! Hi; I'm working on localhost. I could'nt login to my frontend !! I always get a message "ERROR: The password you entered for the username admin is incorrect. " sorry but have not experience with "domaine.fr"
I recommend you to find normal standard host providers like: hostgator.com, hostmonster.com, godaddy.com. or we can recommend you our partners hosting at www.m9host.com. 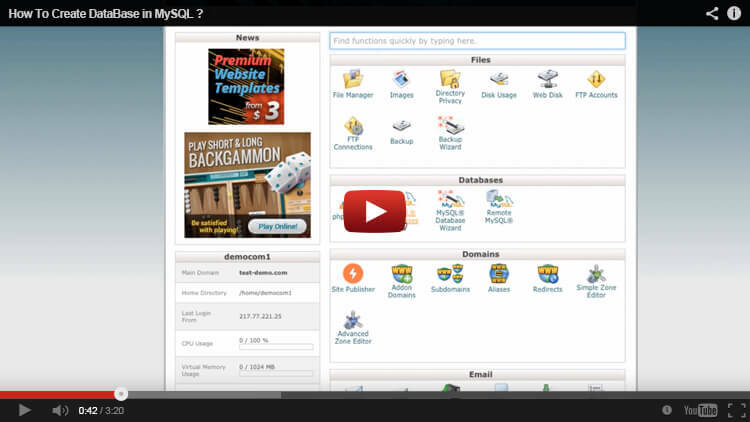 the first month is free at m9hgost.com and they have the cheapest fastest and easiest hosting. THanks ! it's work on localhost. I have domain on domaine.fr not panel. So how can i add the template to my damain on domaine.fr???? should i change some setting on domaine.fr??? please send on this email address following information: if you installed WordPress please send your WordPress admin area URL address, username, and password. If you didn't install WordPress, please send your hosting cPanel address, username and password and your site URL address too. Hi, I would like to use Radio stream plugin. Where can I buy it? I see you changed logo. What is the problem ? Good day, I am trying to install the theme and have an issue with one of the steps; you state to go to gridgum.net/wordpres/blueradio/ yet, I get a DNS error that server can't be found. How can I set this up to install the theme to my Wordpress site? I bought the template for wordpress but when I wanted to install the demo I could not get it I bought it with free installation and tried to contact me on the web where I bought the template. No answer. Can someone help me? Here is the problem when I import the database. .